Pop sensation Celeste (Natalie Portman), left, prays with daughter Albertine (Raffey Cassidy) in Vox Lux. Photo courtesy of Rolling Stone. Walking out of director Brady Corbet’s film Vox Lux for the second time, I searched for sparkles reflected in the eyes of my friends who sat beside me through the jumbled mess of emotions and hazy memories. Instead, I found neutral tones and blank eyes. Sourness lingered in their taste buds from the unexplained flavor of the three acts of physically graphic violence that serve as the thread weaving the narrative together. 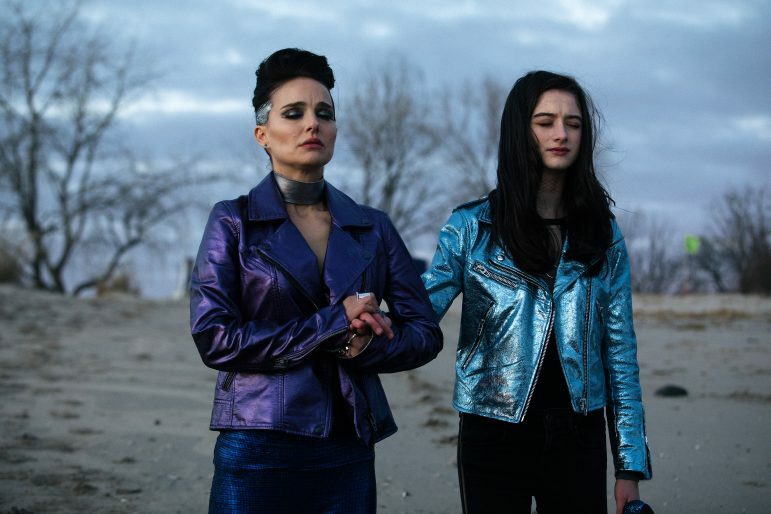 “Prelude 1999,” the first of the three ironically biblically-titled chapters that make up Vox Lux, sets up the film in static, close-up shots of a school massacre – intentionally reminiscent of Columbine High School – that leaves a young Celeste Montgomery (Raffey Cassidy), a shy and devoted Christian, with a bullet lodged in her spine. “Act I: Genesis 2000-2001” depicts Celeste’s struggle toward physical and emotional recovery, both interrupted and reinvigorated by the viral video of her musical performance at the memorial service for her fallen classmates. This acts as the catalyst propelling her into stardom, mutating her into an industrial teen-pop princess travelling the world with her older sister, Ellie, and manager by her side. Vox Lux simultaneously explains nothing and reveals everything in its chaotic glory. Stark jumps in time mirror the dissociative behavior and mindset that dominates Celeste’s mind and memory. Creating a raw emotional climate, the long shots, awkward angles and use of slow motion and speed dually dramatize the scenes, creating an uncomfortable and cringeworthy atmosphere that is simultaneously familiar and foreign to the viewer. Montages integrate seamlessly into mainstream scenes with an aftertaste of conscious cliche hovering in the air. It is technically masterful, emotionally affective, well-acted and yet, an entire anarchic mess. The casual narration revealing Celeste’s drug addiction and consumption of household cleaning products still lingers with me. Describing an attention-grabbing narrative in mere passing, no development or footage seen makes it more audacious. The audience lacks a front-row seat to her public meltdown. Deposits of small bits and pieces of trauma and pain without further explanation confound the most. The seemingly out-of-place appearances of terrorism exist beyond a pretentious and vague comment on the current epidemic of global and domestic terrorism. These acts happen in the background of our lives, taking pieces of ourselves some times and not others. She looked death in the eye. Death is a young boy with eyeliner and a gun. Death is anything and everything. While terrorism superficially appears to be the star of the movie, reminiscent of current society’s obsession with appropriating a community’s sorrow as one’s own, it depersonalizes her trauma by transforming it into something with which one can empathize. Even her own trauma does not belong to her – she must belong to the world. This parallel manipulation and exploitation of tragedy alienates the audience from Celeste. We watch the violence. We watch Celeste endure the violence. We watch the public watch Celeste recover from the violence. We watch Celeste react to 9/11 as the public typically reacts to terrorism: isolated, afar and directly unaffected. The pain never truly runs through our veins; we get only glimpses of Celeste’s withering emotional landscape. Instead, the narrator explains and explains; her trauma belongs to the story and the narrator. The last 15 minutes of Vox Lux, in which the viewer is invited to watch Celeste’s concert in real time, are fundamentally unbearable. The robotic lyrics and strained dance steps are excruciating. Discomfort creeps up your spine, weaving through your arms and dissolving at your fingertips. These fingertips attempt to grasp at the nothingness of the performance. This is a story of a struggling girl becoming a woman, a voyeuristic relationship with one’s own pain. As part of its new program “Studio Ghibli Celebration,” Images Cinema will be showing one film per month from the classic Japanese animation studio Studio Ghibli from March to November 2019.